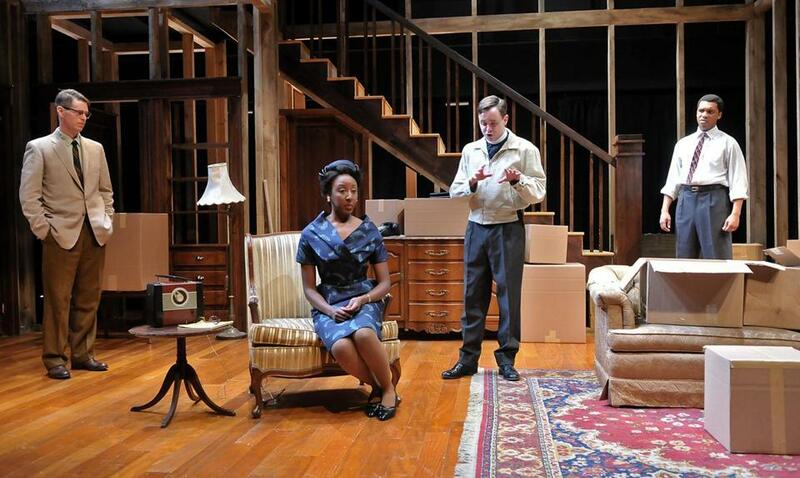 From left: Michael Kaye, Marvelyn McFarlane, Tim Spears, and DeLance Minefee in the SpeakEasy Stage Company’s production of Bruce Norris’s play “Clybourne Park,” at Roberts Studio Theatre, Boston Center for the Arts. Yes, it is. Whatever the ostensible topic of conversation — and circuitous small talk certainly abounds in Bruce Norris’s Pulitzer- and Tony-winning drama — the true subject is almost always race. And in M. Bevin O’Gara’s sharp and penetrating production of “Clybourne Park’’ at SpeakEasy Stage Company, the fuse is always lit. The only question is when the explosion will come. Though the Youngers are never seen, that event is pivotal to Act 1 of “Clybourne Park,’’ while the issue of gentrification is central to Act 2. Norris uses the dual-eras structure to examine the forms that racism took then and takes now, and to ask how much, really, has changed. But the playwright’s approach is not grandly didactic. What interests Norris are individual interactions, the small verbal giveaways of his characters, the condescending or presumptuous bits of behavior that underscore a sense of entitlement, the ways that assumptions can collide or boomerang. To his gifted ear for language O’Gara has added her sharp eye for dramatic tableaus and her careful sense of pace. Some of the most telling scenes in this “Clybourne Park’’ feature black characters sitting silently — not just unheard but essentially unseen — while self-absorbed white characters natter on. To speak is to be exposed, eventually, in the social X-ray that is “Clybourne Park.’’ That sense of exposure, of peering into the very bones of the people onstage, is given visual form by Cristina Todesco’s skeletal set, a large wooden framework that includes a staircase leading to a second floor. On the first floor, couches are crammed with packing boxes during Act 1, filled with the belongings of Russ (Thomas Derrah) and Bev (Paula Plum), a middle-aged couple who have just sold their house. Derrah superbly captures Russ’s anger — first throttled, then unleashed — while Plum’s Bev is a skilled portrait of a woman who is well-meaning, at least by the standards of 1959, but also oblivious. Bev seems to believe her relationship with her African-American housekeeper, Francine (Marvelyn McFarlane), amounts to a genuine friendship. Francine is under no such illusions. McFarlane delivers a first-rate performance, subtly conveying Francine’s simmering anger and steely resolve in small looks and gestures. After Francine politely but firmly declines Bev’s offer of a chafing dish not once, not twice, but three times, Bev blithely responds, “You think about it and let me know,’’ as if Francine had not spoken at all. When Francine’s husband, Albert (DeLance Minefee), arrives to pick her up, Bev thinks nothing of asking him to help move a large trunk from upstairs. But what makes the sparks fly is, first, the insistence by an insipid minister (Tim Spears) on bringing up a family tragedy, and then, the pressure tactics of a neighbor named Karl Lindner (Michael Kaye). If you’ve seen or read “A Raisin in the Sun,’’ you’ll recall Lindner as the man who, hoping to keep the neighborhood segregated, makes an offer to the Youngers to buy the house for more than they paid for it. In “Clybourne Park,’’ Lindner informs Russ and Bev that the family who has purchased their home is black and leans hard on them to rescind the sale. What’s telling about the ensuing confrontation is that it’s clear Russ’s motives have nothing to do with enlightened racial views. It’s a mark of Norris’s unsentimental awareness that the roots of progress can sometimes be tangled and unpretty. In Act 2, which unfolds a half-century later, the neighborhood is now largely African-American, and the forces of gentrification are literally at the door, in the form of a young white couple, Steve (Kaye) and Lindsey (Philana Mia, excellent). They have bought the house and plan to tear it down, then build a new one larger than the prevailing height limits of the neighborhood. With a kind of icy fire, McFarlane plays Lena, a member of the homeowners’ association, who has a personal connection to the house. Minefee portrays her husband, Kevin, while Plum and Spears play lawyers for the respective sides, and Derrah is a contractor who makes sporadic appearances. Everyone is elaborately civil, for a while, but Lena has a few things she wants to say to Steve and Lindsey about the neighborhood’s history, and about the broader meaning of the changes it has undergone. When she finally gets a chance to say them, and when Steve decides he just has to tell a certain racially-charged joke, “Clybourne Park’’ heats up again, reminding us that the real estate of the mind is the most volatile, and hardest to change, place of all.